Location update: After meeting at the top of the McWane Center parking deck at 5:30, the second chimney we will visit for this Swift Night Out is located at the Birmingham Housing Authority, at the NW corner of 19th Street South and 3rd Avenue South (1826 3rd Ave S, Birmingham, AL 35233). The best place to view the chimney—and the location where we’ll meet up after McWane around 6:00—is at the corner of 19th Street and 2nd Avenue South, in front of Architecture Works. It’s about a four-block walk from McWane Center. We have been given permission to leave our cars parked at the McWane Center while we walk to the second location and then to dinner and the after-party at the Pizitz Food Hall courtyard. We’ll be given tokens to exit their parking deck. Swift Nights Out are back in Birmingham! Join us downtown as we enjoy the last of three evenings with one of our favorite urban birds, the Chimney Swift (Chaetura pelagica). After these aerial acrobats have fledged their young and cleared out their nests, the entire North American population makes its way south to winter along the remote headwaters of the Amazon River. On their way there, they congregate in huge roosting flocks with as many as two or three thousand birds sharing a single chimney—numbers that make for a tremendous spectacle when they all pour into the tiny opening at once. Chimney swifts at Avondale Elementary. Video: David Fisher. 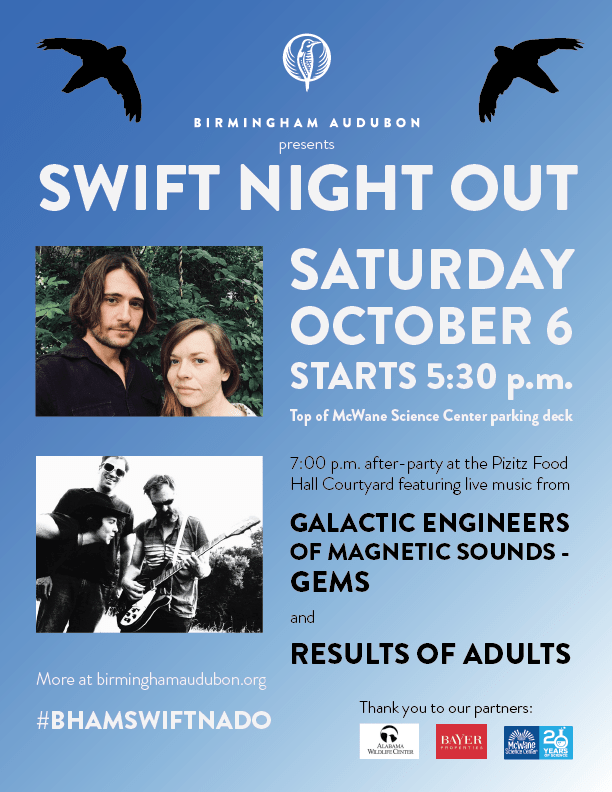 We’ll meet at the top of the McWane Science Center parking deck at 5:30 p.m. to dedicate their swift tower sponsored by Birmingham Audubon. Here we will be able to see other active chimneys that are visible from this location as well. Then, we will walk, carpool, or bicycle to one of downtown’s active swift chimneys. Together, we’ll wait for sunset (6:25 p.m.), watch the swifts work themselves up into their nightly “swiftnado,” and then count the number of individuals who enter the roost. Best of all, the data we produce will help researchers at the Chimney Swift Conservation Association (chimneyswifts.org) get a better sense of trends in eastern swift populations and the effects of climate change on these birds’ annual migratory cycle. Meetup is at 5:30 p.m. at the top of the parking deck at the McWane Science Center (200 19th St. N.)—the entrance to the parking deck is on 2nd Ave. N.
Which chimney we visit after going to the McWane Center will depend on the work of our dedicated chimney swift scouting volunteers; they’ll spend part of September looking for active roosts and identifying the most convenient spots for viewing. Check back here for more details. Binoculars are handy, but certainly not necessary, for viewing the swifts as they assemble in the skies above the chimney. If you’re a social media user, we strongly encourage you to share your thoughts and photos with the hashtag #BhamSwiftnado. Courtyard outside the Pizitz Food Hall. Photo: Pizitz Food Hall. 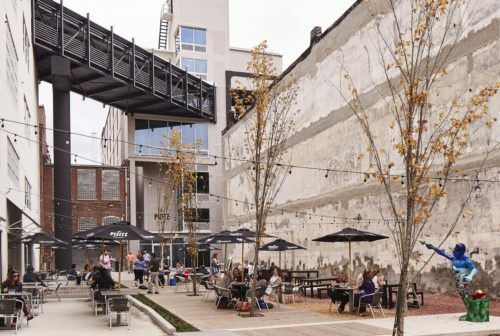 After the viewing party, we will walk, carpool, or bike to the Pizitz Food Hall across the street from the McWane Center to enjoy dinner together and an after-party in the courtyard outside the food hall. Live music will be provided by Galactic Engineers of Magnetic Sounds – GEMS and Results of Adults. Members of our Junior Board will be set up with information about Birmingham Audubon and our efforts to build more swift towers throughout Birmingham. Love swifts? Support our efforts to build chimney swift nesting towers throughout Birmingham. The trip leader: Greg Harber leads this event; his cell phone number is 205-807-8055 (day of the event only). For questions related to this event, email our Outreach & Communications Director Sarah Randolph or call her at 205-719-3678, option 3.